So there’s this moment that just so happens to be the best one of my entire life. And I’m so lucky to have a picture of it. This is it. The exact moment my babies met for the first time. Though I had dreamt of it for so long, I was nervous and anxious. We have a big gap between our two. It wasn’t what we wanted, it wasn’t what we planned, but if we’ve learned nothing else we know that we have little, if any, control. We had wanted Frankie with all of our hearts and souls, but during my pregnancy I kept thinking What 5.5 year old wants a baby sibling? The consolation was we were *sure* it was a boy! I called my parents in the morning to tell Tristan the news. “Mommy had the baby! You have a little sister.” A sister? He seemed unfazed, but he’s not good on the phone. He gets that from his dad. 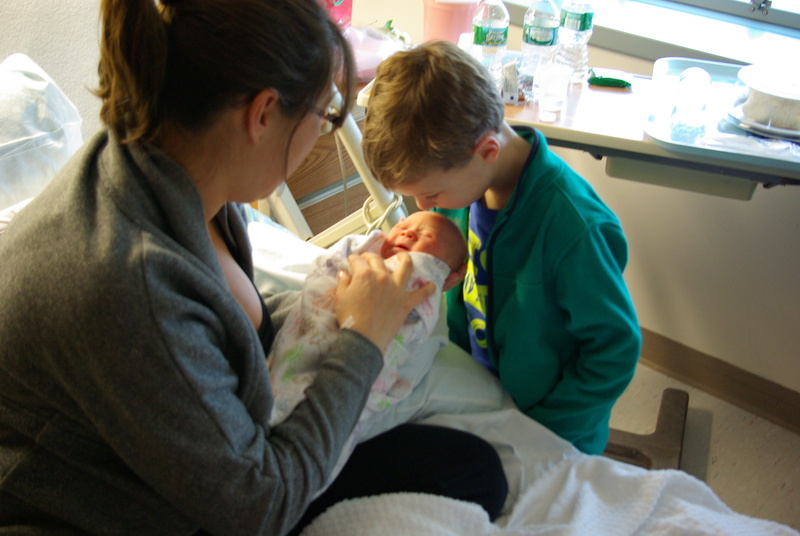 So with the doom and gloom of a Down syndrome diagnosis already hanging thick in the air – by this time the hospital pediatrician had visited us and had told us it was suspected – I was now anxiously waiting for my parents to bring Tristan up to the hospital to meet his baby sister. A moment that I was sure would bring indifference, uncertainty and at worst, disappointment. But then this happened. He came over to my bed side, I held her out to him and he – unprompted – bent over and kissed her forehead so sweetly and so tenderly. My heart nearly burst. In just one gesture my little boy showed me the very definition of love and acceptance. He welcomed her into our little family without the slightest hesitation, like he had known her his entire life. He knew in an instant what we were struggling with since she arrived early that morning – she belonged with us. You know I’d be lying if I said that this meeting of these two beautiful souls put ALL of my fears about Francesca’s future to rest. But, at that moment, I was sure she had a brother, a friend and a protector like no other for all of her life. And I felt a sense of peace enter my heart. In case I haven’t said it my children are pretty amazing. But yours are, too.